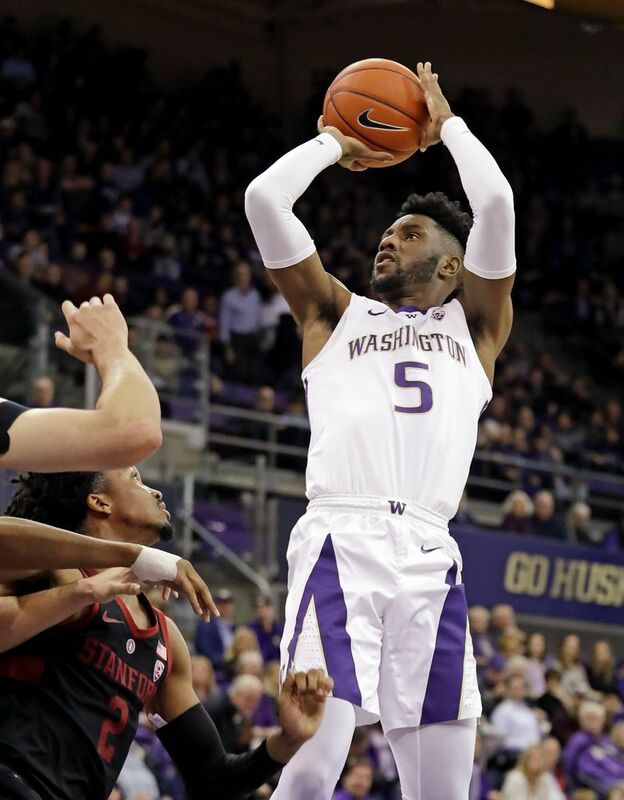 Jaylen Nowell scores 22 points to lead Washington to an 80-64 victory over Stanford. 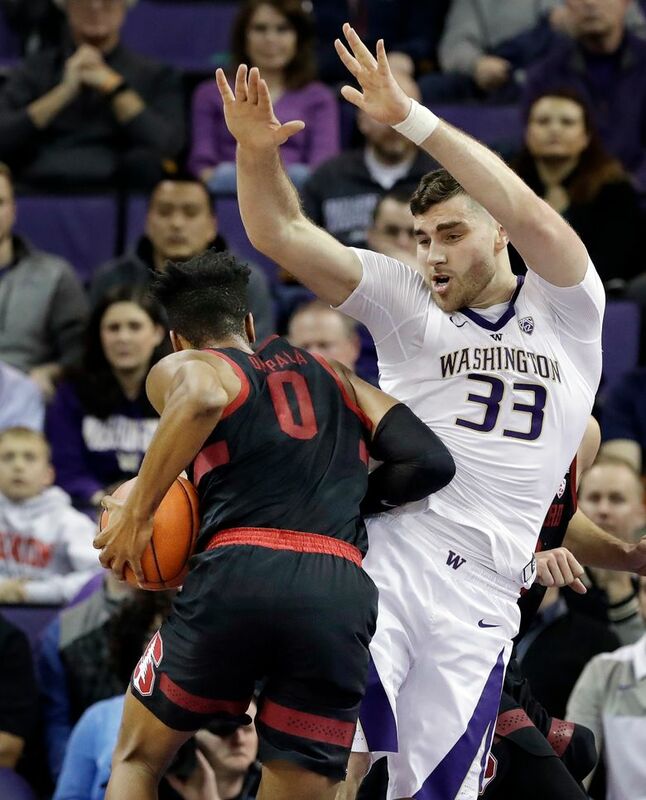 The Huskies made 6 of 14 three-pointers and are the only unbeaten team in conference play, but coach Mike Hopkins says the Huskies can't afford to relax. That’s the advice Mike Hopkins gave the Washington men’s basketball team, which took over sole possession of first place in the Pac-12 after Thursday’s 80-64 win over Stanford. “You got to make sure that the things that are going to make us great are not what people write about us, or first place, second place, NET rankings (or) the hype,” the UW coach said. “You got to focus on the team. You got to focus on getting better. 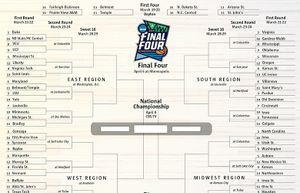 You got to focus on the next game plan. We got to work harder. 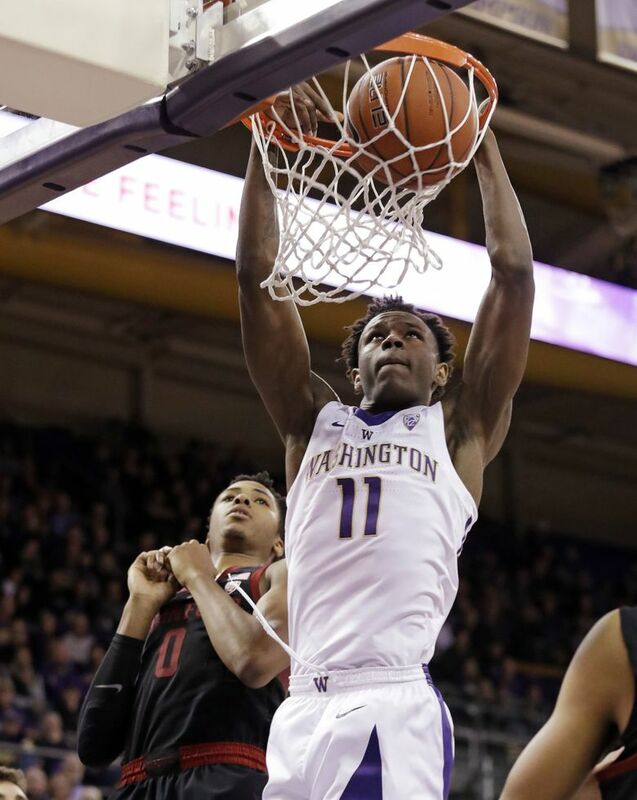 Coming off its first conference road sweep in six years, Washington (13-4, 4-0 Pac-12) avoided a letdown and won its sixth straight game for its best conference start since 2012-13. And the Huskies remained a perfect 9-0 at home in front of 7,852 at Alaska Airlines Arena. Still, Hopkins found reasons to gripe after a lopsided win that ended with him emptying his bench in the final minute. 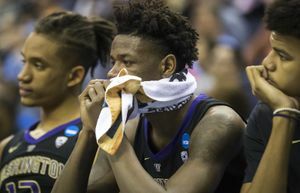 Hopkins doesn’t want the Huskies to become complacent with success, which happened last season after UW started 7-3 in the Pac-12 before a 3-6 finish – including a first-round loss in the conference tournament – doomed its hopes of a NCAA tournament at-large berth. “I’m happy we won, I’m happy we did a lot of really good things, but my job is to correct those little things to become a championship-caliber program,” he said bemoaning Stanford’s 19 fastbreak points in the second half. “I was unhappy in the second half. I felt like we didn’t sprint back on defense. I felt like the ball stopped too much on offense. We got to get better at that if we want to be a championship-caliber team. Down 8-7 early, Washington used an 18-4 run in which six Huskies scored to go up 13 points and never looked back. On the game’s signature play, Carter raced in from behind to block KZ Okplala’s layup attempt at the rim for one of Stanford’s 18 turnovers that led to 24 points. David Crisp recovered the loose ball in the corner and sprinted in the opposite direction while the Stanford players backpedaled. Before the Cardinal could set its defense, Crisp connected with Nowell for a three-pointer that gave the Huskies a 25-12 lead with 7:36 remaining in the first. Stanford hit just 3 of 15 three-pointers while Washington was 6 of 14 behind the arc. Nowell and Dominic Green (11 points) did most of the damage from outside and combined for five 3-pointers. Meanwhile, Crisp, who hit 12 of 18 three-pointers in the previous three games, cooled off from long range. He was 0 for 3 on 3-pointers, but finished with 10 points. The Huskies led 37-24 at halftime. Stanford cut its deficit to nine points (53-44) midway in the second half, but couldn’t get any closer after Green buried a three-pointer to start at 9-2 run. That’s when Carter took over and carried the Huskies for long stretches offensively while converting several dribble-drive, pull-up jumpers. Okpala scored 22 points and Josh Sharma had 17 for Stanford (8-9, 1-4). Daejon Davis, the former UW Husky commit and Garfield High star, tallied eight points on 1-for-7 shooting and committed a game-high five turnovers.